This easy supper, made from all healthy ingredients, fills you up but doesn't leave you feeling overstuffed. Perfectly cooked salmon on a bed of savory seasoned vegetables with lentils makes this recipe one of our favorites. For those who have never been fond of lentils, like myself, will find this way of cooking lentils definitely worth making again. Place the lentils in a heat-proof bowl and cover with boiling water. Set aside for 15 to 20 minutes, then drain. Meanwhile, heat 2 Tbs olive oil in a saute pan; add onions, leeks, thyme, salt, and pepper and cook over medium heat for 10 minutes, until the onions are translucent. Add the garlic and cook for 2 more minutes. Add the drained lentils, celery, carrots, vegetable broth, and tomato paste. Cover and simmer over low heat for 20 minutes or until lentils are tender. Add red wine vinegar and season to taste. For the salmon: Heat a dry oven-proof saute pan over high heat for 4 minutes. Meanwhile, rub both sides of the salmon fillets with olive oil and season the tops with salt and pepper. When pan is very hot, place fillets, seasoned side down, in the pan and cook over medium heat without moving them for 2 minutes until very browned. Turn the fillets and place the pan in the oven for 5 minutes. 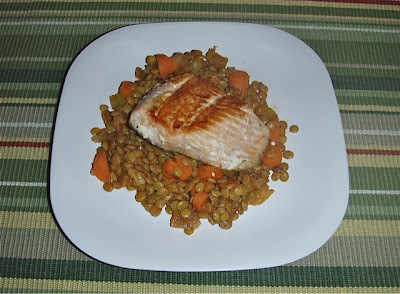 Spoon a cup of the vegetables and lentils on a plate and place a salmon fillet on top. If you'd like a printer-friendly version of this recipe, Click Here.